Today, we warmly welcome Author Maggie Adams. Maggie Adams is an Amazon Best-selling contemporary romance author. 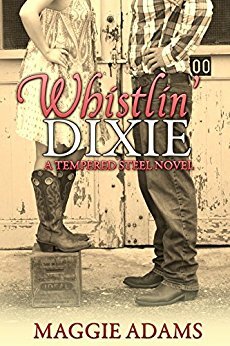 She's the recipient of the Dayreader Review's Best New Series award in 2015 for her Tempered Steel series. Her series has launched the tiny town of Grafton, Illinois into international recognition. When Maggie isn't writing, she enjoys traveling (usually to the grocery store) dancing (around the kitchen to avoid cooking) and relaxing with her family (aka taking a nap while watching a movie.) She loves to chat, so make sure to look her up. A few years ago, the tiny village of Grafton, Illinois, nestled along the banks of the mighty Mississippi River, was almost completely destroyed by a flood. Rather than pull up stakes and move elsewhere, many residents vowed to rebuild their hometown, making it bigger and better than ever. One resident was Mac Coalson, eldest son of Hank and Ginny Coalson. Mac, together with his parents and six brothers, set about the arduous task of clearing, cleaning, and repairing what could be saved. Not everyone was happy to be rebuilding the town. When vandals strike the new construction sites, it's up to Mac and his brothers to catch the culprit before anyone is hurt. The brothers: Mac, Sam-an ex-Navy SEAL, Chance-the Cassanova, Lawrence "Lucky", Brandon, Nick, and Tanner...are in for some wild shenanigans as they protect Grafton and those they love. In Book 1 of The Tempered Steel series, we find Mackenzie Coalson determined to rebuild his hometown after a flood all but destroys Grafton, Illinois. He has no time for a relationship...or all the romantic junk that goes with it. He has a vandal to catch and no sweet-smelling bundle of femininity is going to sway him. When the two unite to catch a potential murderer, it's in everyone's best interest to keep it "business only." But, that's hard to do when their combined attraction is volatile enough to burn down the town.